The RAISE Act is a sensible immigration plan. Can it pass? How immigration restrictionists could turn the RAISE Act into a plan Congress and America could get behind. President Donald Trump introduces the RAISE Act with Sen. Tom Cotton and Sen. David Perdue at the White House on Aug. 2. Americans are less divided on immigration than you might think. If the question is whether we ought to admit more immigrants or fewer of them, you’ll certainly find disagreement. But when you ask about the kind of immigrants we should admit, there is something close to a consensus. Political scientists Jens Hainmueller of MIT and Daniel Hopkins of the University of Pennsylvania have found that preferences vary relatively little according to education, partisanship, labor market position, or the respondent’s level of ethnocentrism. Given a choice, Americans of all types strongly favor admitting highly educated, English-speaking immigrants in high-status jobs. You’d think, then, that overhauling America’s immigration policies would be fairly straightforward: Let’s just reform the system to make it more selective and skills-based. 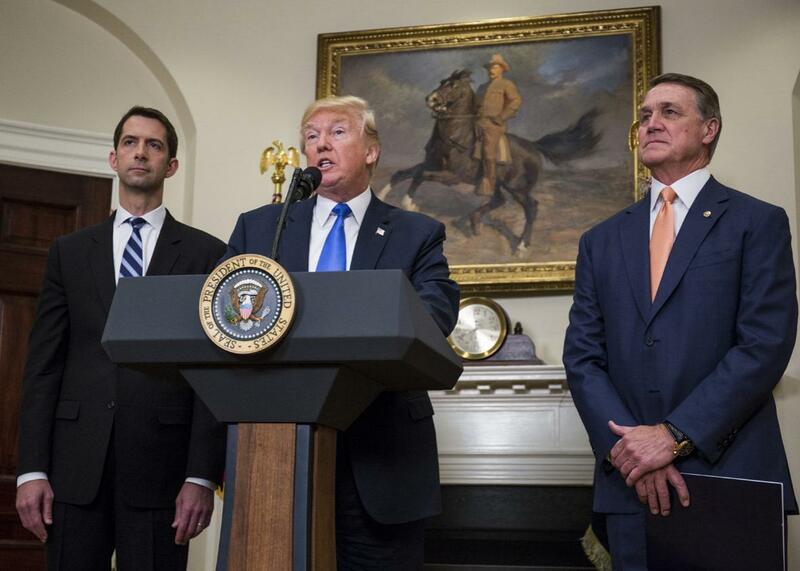 That is roughly the tack Arkansas Sen. Tom Cotton and Georgia Sen. David Perdue have taken with the RAISE Act, a bill that aims to reduce the overall level of legal immigration to the U.S. while dramatically increasing the share of new immigrants earning high incomes. It does so by phasing out family sponsored preference categories for the siblings and adult children of citizens, which would greatly reduce family-based immigration over time, while at the same time replacing today’s employment-based immigration system with a streamlined points system, which would prioritize immigrants with valuable skills and high-paying U.S. job offers. This certainly sounds like the kind of immigration reform Americans could get behind. But while many Americans say they want to reduce immigration levels, they will then balk at reducing admissions from any given category. (This is akin to how Americans say they want smaller government while opposing every specific effort to eliminate or even cut spending on a particular government program.) That’s why passing the RAISE Act will be enormously difficult. The biggest advantage Cotton and Perdue have—the enthusiastic support of President Donald Trump—is in some sense also their biggest liability. The RAISE Act will need a filibuster-proof majority in the Senate, and that would be hard to come by even under the best of circumstances. Blue-state Democrats are uniformly opposed to the bill in part out of loyalty to naturalized citizens, a mostly Democratic constituency. Winning over red-state Democrats, especially those up for re-election in 2018, will be absolutely crucial. It will also be tough as red-state Democrats depend on socially liberal blue-state donors to bankroll their campaigns. These Democrats will have to weigh whether the benefits of supporting the RAISE Act are worth the high cost of seeming to get in bed with Trump. And there’s no guarantee that GOP senators will unite behind the bill either. Republicans attuned to the interests of low-wage employers are skeptical because a more selective, skills-based immigration system does nothing for the agriculture or tourism sectors, which play an outsize role in many GOP districts and states. To have any hope of succeeding, the RAISE Act will have to cobble together a broader coalition. The one thing Cotton and Perdue shouldn’t compromise on is reducing family-based admissions. In a typical year, roughly two-thirds of green cards are granted to those with family ties to U.S. citizens and lawful permanent residents, or LPRs. Though the RAISE Act would curtail family-based immigration by phasing out some family sponsored preference categories, U.S. citizens and LPRs would still have the right to sponsor spouses and minor children. The elderly parents of citizens, who’ve represented as many as one-fifth of all family-based immigrants to the U.S. in recent years, would be able to enter the country under long-term, renewable nonimmigrant visas as long as their citizen relatives could prove they had purchased health insurance for them. Moreover, extended family members could still apply for employment-based visas via the RAISE Act’s points system, and those who are currently on the waiting list for green cards would be given additional points. There is no question that many naturalized citizens will object to the bill’s limits on family-based admissions, but to be cynical for a moment, they matter less in political terms than you might think. Megan McArdle of Bloomberg View has estimated that naturalized citizens represent roughly 6 percent of all eligible voters, and it is well-established that they vote at much lower rates than the native-born. Because the RAISE Act doesn’t touch family immigration rights for the closest relatives of citizens and LPRs, it would still account for the most sympathetic cases. And the longer immigrants live in the U.S., the more likely they are to embrace restrictionist views themselves. Though Democratic-leaning, naturalized citizens aren’t uniformly in favor of high immigration levels. Ironically enough, unauthorized immigrants might have a larger impact on the debate. Until the Deferred Action for Child Arrivals program granted work authorization to hundreds of thousands of unauthorized immigrants who entered the U.S. as minors, the Dreamers proved to be an incredibly effective social movement. DACA took some of the wind out of the movement’s sails by making the issue less urgent, at least for a time. Now, however, there is a very real possibility that DACA might be struck down in the courts, in which case it’s easy to imagine a mass mobilization of Dreamers and their allies. This creates an intriguing opportunity for champions of the RAISE Act, namely that they package their bill with a DREAM-style amnesty for unauthorized immigrants who entered the country as children, or perhaps something a bit broader. Leading restrictionists seem open to a compromise along these lines, and while those who support increasing immigration levels might not like combining an amnesty with cuts to legal immigration, such a move would represent a huge gain for the Dreamers. Senate Democrats may well refuse to accept such a deal, perhaps out of confidence that they could strike a much better one with a Democratic president in the White House in 2021. But there’d be a strong case for them to protect the interests of Dreamers now. A deal along these lines might also win over Senate Republicans like Lindsey Graham, Marco Rubio, and Jeff Flake, who’ve to date been opposed to the RAISE Act. More broadly, Cotton and Perdue would do well to factor in the interests of low-wage employers. A combination of intensified immigration enforcement and demographic change in Latin America has meant that the flow of unauthorized less-skilled labor into the U.S. has fallen in recent years, which has put pressure on firms that have built their business models around the ready availability of low-wage workers. Some firms are successfully adapting to new conditions by adopting more capital-intensive business models, which require fewer workers who as a general rule are better-paid and more highly skilled. Others have made greater use of guest-worker programs, such as H-2B visas for seasonal workers. The RAISE Act leaves guest-worker programs untouched, and though it reduces family-based admissions, its impact on employers in the agriculture and tourism sectors is likely to be limited. At the same time, the bill doesn’t really do anything for low-wage employers as its aim is to reduce less-skilled immigration and, in effect, to nudge employers into adopting more capital-intensive, higher-wage business models. To defang some of the opposition from low-wage employers, Cotton and Perdue might consider buying them off by, for example, creating a targeted subsidy to help them raise their productivity levels. While this wouldn’t win over all low-wage employers, it would send a signal that restrictionists take their concerns seriously. Finally, there’s a case to be made that with a well-designed points system in place, it wouldn’t be so urgently important to reduce overall immigration levels. To restrictionists who care most deeply about the overall number of immigrants, compromising on this front would be unacceptable. But softening on numbers might make the politics of the RAISE Act a bit more attractive, especially to high-wage employers who’d welcome the prospect of an increase in the size of America’s skilled workforce. How could the RAISE Act be redesigned to increase skilled immigration levels? One approach would be to increase the number of employment-based visas. Right now, the RAISE Act simplifies how employment-based visas are doled out with its points system, but it keeps the number of those visas flat at 140,000. This cap could be raised to, say, 200,000, which would sweeten the deal for high-wage employers hungry for talent. Or the bill could keep the cap at 140,000, but only count primary applicants against it. Today, when an immigrant applies for an employment-based visa, she is entitled to bring her spouse and children along with her. However, her entire family counts against the cap. This means that of the 140,000 employment-based visas granted every year, a large proportion actually go to the immediate family members accompanying the primary applicants. If spouses and children were exempt from the cap, the effective amount of skilled immigration would greatly increase, even if the cap remained the same. Embracing this approach might be a bridge too far for restrictionists. It would, however, expand the RAISE Act’s winner’s circle, which could make passing the bill a lighter lift.